Sign up for free and just shop with Bloom and Wild as normal. Our average member earns over £300 cashback a year. Bloom and Wild cashback can be earned simply by clicking through to the merchant and shopping as normal. Bloom and Wild Cashback is available through TopCashback on genuine, tracked transactions completed immediately and wholly online. Send a gorgeous arrangement of fresh flowers for less when taking advantage of our Bloom and Wild discount code and cashback deals. Designed by their professional florist, your beautiful flowers will arrive in a bespoke presentation box to help maintain the health and quality of the stems and ensure every petal is perfect when they are delivered. Bloom and Wild's hand-picked flowers, which are carefully selected, are sent in bud to ensure that each bunch will be long lasting and maintain its floral beauty for days, while it also means the recipient can have their flowers delivered through the letterbox, ensuring there is no need to wait in for them. All flowers are packed by hand and they use protective netting on larger flowers to keep them in perfect condition, while each exciting, on-trend, seasonal flower bouquet comes with care tips and arrangement instructions. They offer next day delivery, while you can order flowers on the go thanks to their free app. Sign up for their newsletter, meanwhile, and you will get 10% off your first order. Whether you are buying for Mother's Day, Valentine's Day or any other special occasion, or just want to make someone feel better you will find a great variety of letterbox arrangements to choose from. Whatever your loved one or family member's favourite flowers are, their bouquets feature roses, freesias, snapdragons, lilies and more, while you can also buy arrangements which come with biscuits, truffles and chocolates. Order a chilli plant, posy bottles or a whiskey set, while you can search their peonies and hand-tied ranges or view bestsellers, gift subscriptions and business flowers for the office. 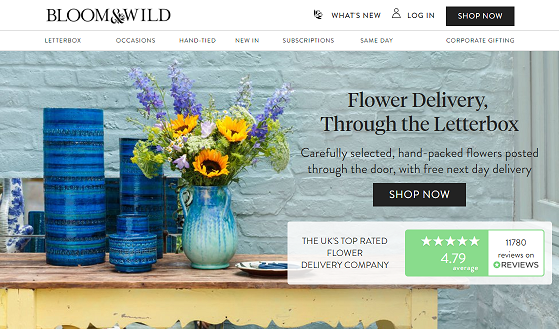 Sign up to TopCashback using the form you will discover at the bottom of this page and you will be able to save when you send flowers online with our discounts for Bloom and Wild. If you love always having fresh flowers in your home, or you want to give someone you love an extra special gift, then choose one of Bloom and Wild's flower subscriptions and different bouquets will be delivered at a frequency of your choice. The regular letterbox subscription is the most affordable way of sending flowers as they are available from £15 per bouquet. Their Lux range features exceptional blooms which offer more stems and which will arrive in premium packaging at a cost from £20 per bouquet. With both of these options, you can choose weekly, fortnightly or monthly deliveries for three, six or 12 months, while you can also opt for an ongoing subscription. Choose your first bouquet, while you can pay in advance or as you go. You can also choose a prepaid gift subscription offering monthly deliveries for three, six or 12 months. With flower subscriptions, you can manage your delivery dates, pause it and change the address. Order flowers online wherever you are by downloading the Bloom and Wild app for your iOS or Android device from the App Store or Google Play. In the time it takes to send a text message, you can order fresh flowers, gifts and more on the go. The simple app interface means you can arrange flower delivery in seconds, while you can save special occasions and receive notifications to ensure you never forget to send a beautiful bouquet to wish someone a happy birthday or anniversary. The app will integrate with your phone's calendar, while the 'photograph your card' feature is great for making a quick payment. Take advantage of exclusive app-only offers and benefits, while you will receive tracked delivery notifications, meaning you will know exactly where your Bloom and Wild flowers are and when they have arrived. Bloom and Wild flowers are hand-picked and individually packed before being delivered across the UK and Ireland to bloom. Their letterbox flowers are sent via Royal Mail's tracked service for free and will arrive in the post the next day. Place your order before 5.30pm Monday-Friday the day before you want them to arrive and, although it is not a guaranteed next day service, 95% of flowers sent via this method will arrive on the chosen day. You will receive an email containing a tracking link so you can check the progress of your order. They do offer a guaranteed next day delivery service to the majority of the UK, provided by DPD. This is free for hand-tied bouquets and £5 for letterbox bouquets delivered Monday-Friday, and £6 for Saturday delivery. Orders must be placed before 5pm the day before delivery, while you will receive a one-hour window on the day. If you live in certain central, south and west London postcodes, they offer a two-hour delivery service from 9am-6pm. Send a one-off bouquet or choose a monthly flower gift subscription with Bloom & Wild and get a great cashback reward delivered to your account with these red hot deals. Order flowers in under a minute and you do not have to worry about the recipient being at home as their flowers will fit through the letterbox. Bloom & Wild's flowers are always beautifully packaged and in perfect condition. Whether they are for a birthday, Valentine's Day, an anniversary or just to say 'thank you', each bouquet is stunning and long lasting, and are designed by their professional florist. Their subscriptions mean you can send bouquets featuring roses, carnations and lilies, as well as orchids, weekly, fortnightly or monthly.